Glasschord from the Hans Adler collection. 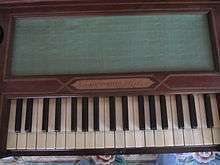 The glasschord (or glasscord) is a crystallophone that resembles the celesta but uses keyboard-driven hammers to strike glass bars instead of metal bars. This article is issued from Wikipedia - version of the 8/23/2014. The text is available under the Creative Commons Attribution/Share Alike but additional terms may apply for the media files.